With HDD Caddy it is now easy to increase the storage space of your laptop or PC! HDD Caddy replaces the optical drive and allows you to add a second internal hard drive to your laptop. Thanks to HDD Caddy there is no need to carry external hard drives or USB sticks anymore! HDD Caddy is also a great solution if you want to use a very fast solid state drive (SSD) in your laptop but still want to enjoy the flexibility of having large storage capacity. HDD Caddy is easy to install and works plug & play. Order safe and secure at HDDCADDY! We continually strive for customer satisfaction in the products we deliver and the services we provide. This means we are committed to fast shipping, in-house quality checking, quick response on all your questions, safe and secure payment and easy return policy. If you have any questions, please don't hesitate to contact us. We are based in the Netherlands, Europe. We ship within and outside Europe. Our customer service is well trained and is daily active to pursue excellent customer care. Our team consist of people with knowledge and experiences in IT hardware and software. We are ready to help you with troubleshooting or preparing an order. Our products are from excellent quality. Parts of our product are designed and assembled in the Netherlands. We also do quality check in-house. All products are shipped from our warehouse. We have a real-time stock indicator on our website. Orders are shipped every business day! Read below for more information about HDD Caddy, hard drives, and SSD. - What are the advantages of using HDD Caddy? 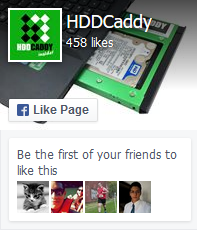 - What hard drive or SSD can you use with HDD Caddy? - The difference between HDD Caddy and HDD Bracket. - SSD and SATAI, SATAII and SATA3? This HDD Caddy replaces the superdrive of the iMac!